Owners of 2011 model-year vehicles experienced more problems than did owners of 2010 model-year vehicles a year ago, according to the just-published J.D. Power 2014 U.S. Vehicle Dependability StudySM (VDS). The study, now in its 25th year, examines problems experienced during the past 12 months by original owners of 2011 model year vehicles. Overall dependability is determined by the number of problems experienced per 100 vehicles (PP100), with a lower score reflecting higher quality. The study finds that overall vehicle dependability averages 133 PP100 for 2011-model vehicles, a 6% increase in problems from 126 PP100 in 2013. This marks the fir st time since the 1998 study that the average number of problems has increased. Engine and transmission problems increase by nearly 6 PP100 year over year, accounting for the majority of the overall 7 PP100 increase in reported problems. The study finds that the increase was greatest--10 PP100--for vehicles with 4-cylinder engines. "Until this year, we have seen a continual improvement in vehicle dependability," said David Sargent, vice president of global automotive at J.D. Power. "However, some of the changes that automakers implemented for the 2011 model year have led to a noticeable increase in problems reported. "Automakers are continually looking for ways to improve fuel economy, which is a primary purchase motivator for many consumers, particularly those buying smaller vehicles," Sargent explains. "However, while striving to reduce fuel consumption, automakers must be careful not to compromise quality. Increases in such problems as engine hesitation, rough transmission shifts, and lack of power indicate that this is a continuing challenge." Lexus ranks highest in vehicle dependability among all nameplates for a third consecutive year, with a substantial gap between Lexus and other brands. Lexus vehicles from the 2011 model year average 68 PP100, compared with second-ranked Mercedes-Benz (104 PP100), followed by Cadillac (107 PP100), Acura (109 PP100), and Buick (112 PP100)--the only non-premium brand among the top five. General Motors receives eight segment awards--more than any other automaker in 2014--for the Buick Lucerne; Cadillac DTS (tie); Cadillac Escalade; Chevrolet Camaro; Chevrolet Volt; GMC Sierra HD; GMC Sierra LD (light-duty); and GMC Yukon. Toyota Motor Corp. earns seven awards: for the Lexus ES; Lexus GS; Lexus LS (tie); Lexus RX; Scion xB; Toyota Camry; and Toyota Sienna. Honda Motor Co. receives six model-level awards: for the Acura RDX; Honda CR-V; Honda Crosstour; Honda Element; Honda Fit; and Honda Ridgeline. BMW Group receives one model-level award for the Mini Cooper. J.D. Power also finds that the fewer problems owners experience with their vehicle, the greater their loyalty to the brand. Combined data from previous years' VDS results and vehicle trade-in data from the Power Information Network (PIN) from J.D. Power show that 56% of owners who experienced no problems stay with the same brand when they purchase their next new vehicle. Brand loyalty slips to just 42% among owners who report three or more problems. Finally, a comparison of data from the 2013 VDS with data from the subsequent J.D. Power 2014 U.S. Avoider StudySM shows that consumers are much more likely to avoid vehicles from brands that rank lower in dependability. On average, 23% of consumers avoided brands that rank in the lowest quartile of the 2013 VDS because of concerns about reliability. In contrast, only 9% of consumers cited that same reason for avoiding brands that rank in the top quartile. "By combining our customer research with trade-in data, we see a very strong correlation between dependability and real-world brand loyalty," said Sargent. "Also, we see that brands with lower dependability are likely to be shut out of a significant piece of the market, as many consumers will not even consider purchasing one of their vehicles because of concerns about its likely reliability." When considering the purchase of a new vehicle, find out which makes will be changed significantly from the previous model year. If you're considering a vehicle that features those changes, delay your final decision until several reviews of the vehicle have been published. List any problems you had with your last new vehicle and weigh them against the vehicle's good points when considering whether to stay loyal to that make. Know the long-term reputations of various vehicle makes, and see what has been done to address long-standing issues. 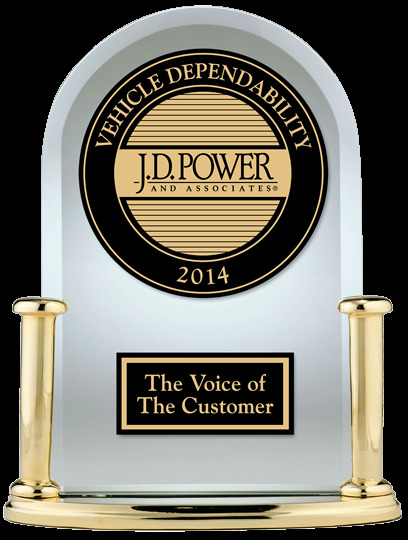 The 2014 Vehicle Dependability Study is based on responses from more than 41,000 original owners of 2011 model-year vehicles after three years of ownership. The study was fielded between October and December 2013.